The City and RIDOT today announced a design competition for the new Providence River Pedestrian Bridge which will replace the old Route 195. The schedule for the competion is quite aggresive, Requests for Qualifications are due by September 17th, finalists who will be invited to submit designs will be notified September 24th, and their designs will be due on October 29th. When the designs are recieved they will go on display at City Hall for public input and then a jury will select the winning design at the end of November. RIDOT estimates it will take 18 months to transfer the winning design into engineering drawings and prepare for construction. All said, the new bridge should be well underway during 2013, which is the year the Iway project officially wraps up. If all goes according to plan, the bridge should be being built at the same time as the streetgrid is being rebuilt and the parks are being built on either bank of the river. RIDOT Director Michael Lewis also announced that Bids for the removal of the old route 195 were being accepted starting this morning. The winning bid should be award this fall with demolition getting underway next year (I assume around March, start of construction season, as always, weather dependent). As part of the first phase of the design selection process, the City has issued a Request for Qualifications [.pdf] (RFQ). Interested parties are encouraged to submit a letter of interest, firm profile, a relevant and current project portfolio and appropriate references for review by the Pedestrian Bridge Design Competition Selection Committee. The informational package should be limited to 10 pages. The qualifications package should be submitted electronically via email to planning@providenceri.com by September 17 at 4pm EST. Email submittals must have “Providence River Pedestrian Bridge Design Competition” in the subject line. Firms may also mail or hand deliver a CD to the Department of Planning and Development at 400 Westminster Street, Providence. The next step in the Pedestrian Bridge Design Competition is well underway as architectural firms from around the world position themselves to compete for the top bridge design. Mayor David N. Cicilline announced that approximately 47 firms have responded to the City’s request for qualifications, including 12 local firms and companies from around the world including Spain, France, Sweden, England and China. The Mayor kicked off the Pedestrian Bridge Design Competition September 10th inviting firms to play an important role in linking pedestrians and cyclists from Fox Point and College Hill to the City’s new waterfront parks, the Knowledge District and downtown. 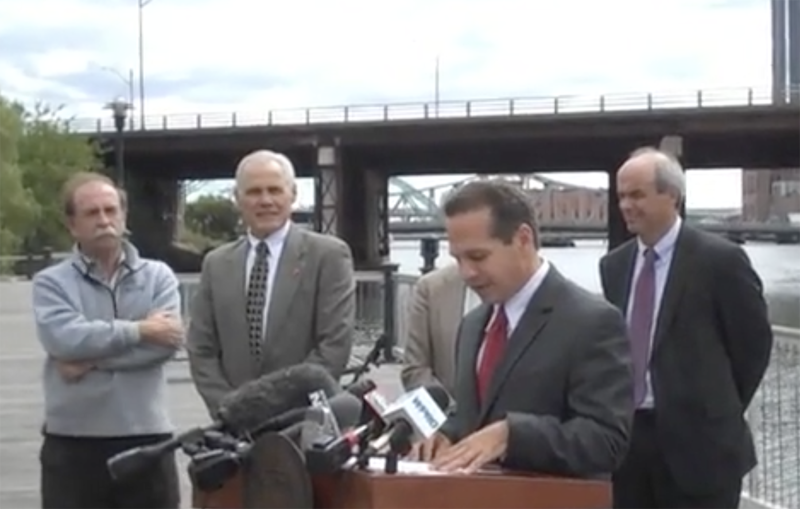 “The fact that the Pedestrian Bridge Design Competition has generated so much interest from a variety of architectural firms bodes well for this project,” said Mayor Cicilline. The Pedestrian Bridge Design Committee, comprised of local architects, neighborhood residents, representatives from local universities, business owners, RIDOT and the City, will review the firms’ qualifications and invite up to 10 finalists to submit bridge designs. Once the finalists present their design proposals, which must be submitted to the Department of Planning & Development by Friday, October 29th, the public will also have an opportunity to review and comment on the designs, which will be on display in City Hall the first week of November. The Committee will take the public’s comments into consideration when selecting the winning design. Mayor Cicilline will announce the winning design the last week in November. RIDOT will use the design to construct the pedestrian bridge on the granite piers of the old I-195 bridge, which will be dismantled as part of the highway relocation project. The pedestrian bridge is slated for completion in 2013. Click here for a complete list of firms that submitted their qualifications for the bridge design competition. Heavens to Betsy that’s a lot of firms! This is a great list. Let’s hope City Planning can make good choices beyond the firms we can all expect to make the list of 10. In particular, I’d root for out of towners like REX, Eric Owen Moss, and Office dA, and locals like Structures Workshop, Studio Providence, and Maia Small. The City of Providence is pleased to announce the following eleven design teams as the finalists for the Providence River Pedestrian Bridge Design Competition. The design teams were selected from 47 highly qualified firms from across the United States and several countries around the world. The eleven design teams will each be invited to submit a single design for the Providence River Pedestrian Bridge. The designs will be presented to the public in early November and will be reviewed by the Selection Committee. A final winner will be announced by Mayor Cicilline in early December. Sometime in November (if not sooner) the designs should be available for public viewing and comment at City Hall.